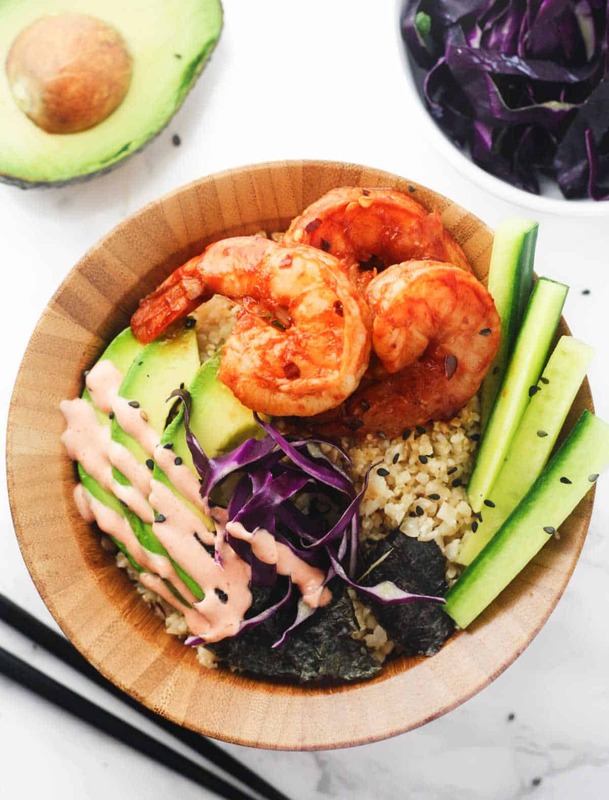 These 20 minute Low Carb Spicy Shrimp Sushi Bowls are basically the definition of what healthy eating should be all about. Boring? nope. Bland? never. Absolutely delicious and bursting with flavor? oooookay now we’re talking. You know what guys? I think that one of the most common misconceptions when it comes to sushi is that many people (including myself for a loooooong time) assume that sushi = healthy. I mean seriously, I don’t know how many times I used to go out with my girlfriends for a sushi date and proudly chow down roll after roll feeling like I had just made the best health decision of life. Haha. Four rolls in and that bloating definitely knocked me back into reality..fast. Now don’t get me wrong, guys. Sushi is still relatively healthy, especially when you compare it to many other restaurants that could have been picked for girls night. Compared to pizza, fettuccine Alfredo and the Chinese buffet…sushi wins hands down, every time. It’s not so much that sushi is just unbelievably bad for you, because I believe it’s faaar from that. The real problem is all of that rice encasing those yummy little rolls. Those sneaky carbs add up surprisingly fast…and then that spicy mayo? Oh, don’t even get me started on the mayo. I also quickly realized that there was actually no way that I would be able to roll everything up to even look like something remotely edible. So we improvised and threw it all into a bowl. The spicy shrimp really brings out a ton of flavor, and the cold cucumber and avocado help to cool things down a little. It’s a perfect flavor harmony, friends! Begin by mixing together the Sriracha, oyster sauce, honey, red pepper flakes* and garlic powder in a large bowl. Add the shrimp and toss to coat evenly. Set the bowl aside for the shrimp to marinate a little while making the cauliflower rice. Break the cauliflower down into small florets and toss them into a food processor. Pulse a few times until the cauliflower has completely broken down and has a rice-like texture. Spray a medium sized skillet and place it on medium heat. Add the cauliflower rice and the soy sauce and cook for approx 5-7 minutes or until the rice is slightly tender. Remove from heat and transfer rice to a heat-safe bowl. Spray the skillet again and cook the shrimp with the sauce on medium heat, approx 2-3 minutes on each side. Set aside. Begin by adding approximately 3/4 cups cauliflower rice to each bowl. Add shrimp, 1/4 sliced avocado, sliced cucumber, chopped red cabbage and 1/4 sushi Nori to each bowl. Mix together the Greek yogurt and Sriracha and drizzle over the food. Enjoy! *Feel free to leave out the red pepper flakes if you don't want your shrimp to be too spicy. Hmmm, way too much sodium for me. However, I will take out the nori, use low sodium soy sauce. You have given me all sorts of ideas for using cauliflower, thank you! I clicked on your cauliflower pot pies and found this recipe. Great blog, girl! All I can say is oh my word this is amazing! I did make it with sushi rice bc my husband is super active and doesn't do low carb but this will definitely be a weekly staple! It's so fresh and delicious! Thanks this was great! My avocados were not ripe so I used mango.